Oh dear God Pizzor has returned for revenge! I think. Umm, well, he has returned at least. What for I am not actually sure. But with his return also comes a new release from the amazing, the incredible, and unstoppable Armcannon! 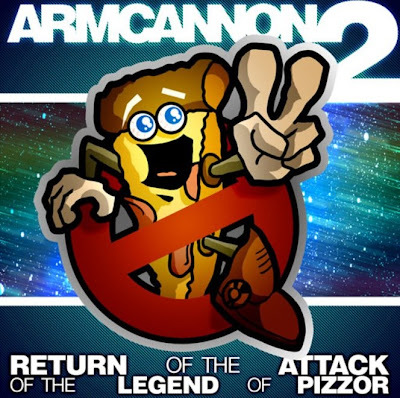 After their incredible debut album, the band returns with Armcannon 2: The Return of the Attack of the Legend of Pizzor, which is available right now for the unbeatable price of $12 via paypal at armcannon.com. The album is 12 tracks of incredible music from not just video games, but even TV and movies, not to mention an original tune thrown in for good measure! I am listening to the album now (review coming soon) and have to say this is just an incredible release which easily keeps up with their incredible debut album. I can not stress enough how much every VG inspired music fan needs this amazing album in their collections! Check out some of the amazing themes they rearrange in the track listing below!